Are young children allowed in the courtrooms? Yes, but given the formal nature of Court sessions, it might be more appropriate to make other arrangements for your children. If you do bring children, they cannot be disruptive to the proceedings. Where can I park when coming to the Courthouse? A limited number of two hour, free parking spaces are located on North Paint Street and Second Street. There is also a municipal lot past the Law Complex on Second Street and at the corner of North Paint Street and Water Street. Arrive early to allow time for locating a parking space. Is there handicapped access to the Courthouse? Yes, there is handicapped access located at the back of the building, along with limited handicapped parking. Additional handicapped parking is available on North Paint Street in front of the Law Complex. The Court is open Monday through Friday, 8 a.m. to 4:00 p.m. except for holidays. Are there any security restrictions on entering the Court? All individuals, other than authorized court personnel, entering the Ross County Court of Common Pleas must pass through a security check, including a metal detector. Guns, knives and weapons of any type are not allowed in the courthouse. Are there any clothing restrictions on entering the Court? Your attire in the courtroom should reflect the seriousness and dignity of the judicial process. Do not wear the following to Court: clothing containing words, pictures or symbols that are obscene, profane, or sexually suggestive, anything associated with drugs, alcohol or gangs, halter tops, tank tops, see-through tops, bare-midriff tops, swim wear, lingerie, pajamas, pants that allow undergarments or bare skin to show such as low cut hip-huggers and loose fitting pants that expose boxer shorts, flip-flops or other overly causal items. Can I use my cell phone or electronic devices in the Court? All cell phones must be turned off upon entering the courtrooms. Only attorneys or the media may use computers or other electronic devices in the courtrooms as necessary for their work. Failure to comply may result in confiscation of devices for the duration of an individual’s presence in the courthouse. If I have legal questions, can someone at the courthouse help me? No, judges and court staff are not allowed to give you legal advice. The filing fee schedule is available on the Ross County Clerk of Court’s website http://courts.co.ross.oh.us/ or by calling the Clerk of Court at 740-702-3010. Judge Michael M. Ater conducts hearings in courtroom 1 located on the second floor of the courthouse. Judge Matthew S. Schmidt conducts hearings in courtroom 2 located on the first floor of the courthouse. Magistrate John Di Ceasare conducts hearings on the second floor. The security officer located at the entrance of the building can direct you to the appropriate courtroom based on the assigned judge or magistrate. Where do I find information regarding a misdemeanor case or traffic violations? 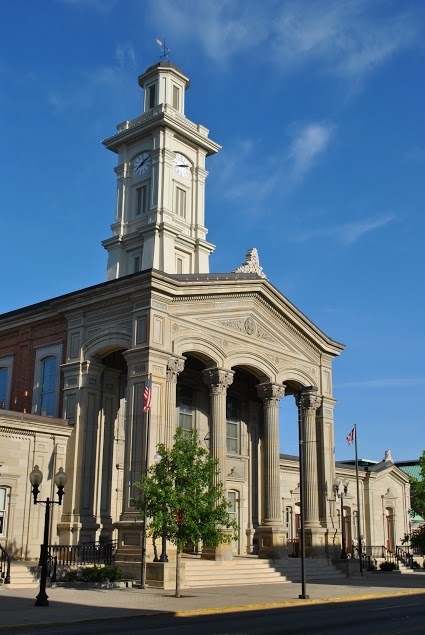 Please contact the Chillicothe Municipal Court at (740) 773-3515 http://www.chillicothemunicipalcourt.org/. Where do I find information regarding juvenile matters? Please contact the Ross County Juvenile Court at (740) 774-1177 http://www.rossprobatejuvenile.com/. Where do I find information regarding probate matters, such as a will, adoption or marriage license? Please contact the Ross County Probate Court at (740) 774-1177 http://www.rossprobatejuvenile.com/Probate.htm. Is the Ross County Probation Department the same as the Adult Parole Authority? No, the Adult Parole Authority can be reached at (740) 702-1200.